I thought I would create this so the 2018 thread doesn`t get clogged up with this content. Way to many people (60) will be getting a chance at this, knock it down to 30. I know the tour has more than 30 events, some will argue that a winner of a particular event might not make the top 30, oh well. Play better golf. Play more consistent golf. I think the biggest issue for lack of a better term is that the Commissioner is spineless when dealing with the sponsors. From what I read it was the sponsor who wanted the changes and sure I think the sponsors should have a say but only a say. The PGA might listen to sponsors but they would make the final decision on what's best their tour. This is the 2nd obvious time the Commish caved to the sponsors, Evian being the other. IMO it can't be argued what Whan has done good by filling the schedule with events but I feel under his tenure he hurts the actual product consumed by the fans and by extension hurts the tour itself. In the end, I feel there are so many positives with this by raising the purse size for women's golf but I just can't get behind it with the regular tour events losing much of their meaning. I assume the top 60 will be decided by money and I think there will be unintended consequences, when planning on taking off events for rest you know every low purse event is gonna be skipped by the top players and thus hurting your other sponsors. Players now are more willing to play small events cause the points are the same (outside Majors) regardless of purse size. I guess the question is how do people feel about Ally McDonald, the 94th ranked player in the world with 3 top 10's this season, that if she had a good week at the event this season and won, that she'd be the Tour Champion in 2018 if this system was currently being used (sorry to pick on Ally). Although I think this would be a poor way to determine the Tour Champion, I prefer a 64 player seeded match play event to get your tour champ. Sure all the big names could be gone by Saturday but for me optically with everyone having a chance to win, would be a better test to get the Champ under the "Everyone has a chance to win" scenario. In the end, I feel there are so many positives with this by raising the purse size for women's golf but I just can't get behind it with the regular tour events losing much of their meaning. Yes the purse is being raised, but only because they are taking away the CME points race money and adding it to the Tour Championship. 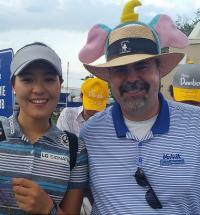 It`s a half a** way to make the LPGA look like they are trying to create larger winnings. The girls have voiced their view on this before, they feel they should be paid more like the guys, this is a clever way to say 'Look at this, we are increasing the winnings slowly".
. I assume the top 60 will be decided by money and I think there will be unintended consequences, when planning on taking off events for rest you know every low purse event is gonna be skipped by the top players and thus hurting your other sponsors. Players now are more willing to play small events cause the points are the same (outside Majors) regardless of purse size. Top 60 will be determined by points, after the final event the points will be erased and the 60 move on to the Tour Championship. Regardless if they use a points system or money to determine the 60, it`s performance based. To a degree, but IMO you need points to determine it. With purse size being different at many events solo 18th at a regular tour event should carry the same weight at each event. Pretty sure the current purse is $2.5 million and there’s another $1 million for the year-long winner. That’s $3.5 million total. The new purse is $5 million. It does. Points are the same for all regular events and higher for majors. I think most people would say "Who`s Ally McDonald"? I don`t even feel a tour winner should be granted a "fair" chance to be considered the Tour Champion, there are handful of winners this year who have no reason to be in that position,IMO. You are correct. My fault. But I don`t feel I`m totally wrong either. It`s essentially "robbing Peter to pay Paul"
I'll withhold final judgement until we see how it plays out. Yes, in theory any of the 60 players could win. However, with a major-sized purse, the pressure will be much higher than a typical event, and the cream usually rises to the top. A number of lower ranked players won this season, but I believe it was in weaker field events. I don't think the format is any worse than the Tour Championship giving the points leader a head start. I'm with Argonne in waiting until we see how it plays out. Besides that, I've never been a fan of having points being carried over into "playoffs". And I bet the players don't think the commissioner is spineless. I'm guessing the players have mixed opinions. The top players are likely not happy, as there's no advantage of busting one's a** all season to get into the Top 5. Heck, I expect a number of players will cut back on their schedules a bit once they've safely concluded they that have enough points for the Tour Championship. The Blue Bay next season is going to be attended by crickets. The lower ranked players will certainly love it. What's not to like about a big purse for the 60th ranked player? The 61st ranked player is going to be extremely p*ssed that the field wasn't expanded to 65. Lol. It's better than the former top 3 from each official money event not already qualified get into the season ending event.